Orange is the awareness color for many causes so; let this t-shirt do the talking for you. Featuring inspirational words of hope and encouragement, this awareness ribbon shirt sends a powerful message to those who see it. 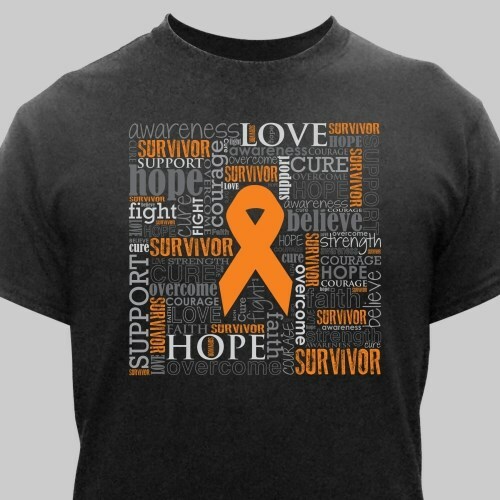 This orange ribbon word-art design is available on our 100% cotton, machine washable t-shirts. Shirts are available in adult sizes S-3XL. 4XL is available in white only. Today’s Price: $17.84 - ON SALE In Stock! Additional Info Browse more Multiple Sclerosis shirts to find the perfect way to show your support.